The study of Islamic manuscripts is a dynamic field of research. This section in the Islamic manuscripts site gives a follow-up to stories in the news and signalizes new publications and events. Readers are invited to offer their notes and remarks (and if possible images as well) for short news flashes. Announcements of new books and new issues of scholarly journals are equally welcome. For further information, please contact the editor. Disclaimer: Note that the dates by which these pages are arranged are the dates on which an event is registered. They are usually not the dates on which the events take place. The owner of this website does not take responsibility for any misunderstanding, damages or otherwise, which may be the result of the use of this page. It should be noted that links in older announcements may not be valid anymore, as broken links are not repaired. July 31, 2013: New publication from Tehran with relevance to the study of Islamic manuscripts. We have just received from The Written Heritage Research Centre (Miras Maktoob), address: No. 1182, 2nd Floor, Unit 9, between Daneshgah and Abureyhan St., Enqelab Ave. Tehran, I.R. Iran, postal code: 1315693519, [contact, website], Gozaresh-e Miras. Bimonthly Journal of Textual Criticism, Codicology and Iranology. vol. 52-53 (June-September 2012) = Second Series, vol. 6, No. 3 and 4. See the table of contents. April 3, 2012: New publication from Tehran with relevance to the study of Islamic manuscripts. We have just received from The Research Centre for the Written Heritage (Miras Maktoob), address: No. 1182, 2nd Floor, Farvardin Building, Between Daneshgah and Abureyhan St., Enghelab Ave. Tehran, I.R. Iran 1315693519 (P.O Box 13185-519), [contact or contact, website], a copy of an important new publication on codicology and bibliography: Arif Naushahi, Siyah bar Safid. Magmu`a-yi Goftar-ha wa Yaddasht-ha dar Zamina-yi Kitabshinasi wa Nuskhashinasi. ('Black on white. Collected Essays and Notes in Codicology and Bibliography'). Tehran (Miras-e Maktoob) 2011. See the table of contents and introductions. March 26, 2012: Important manuscripts of Leiden University online. Brill's of Leiden have in October 2011 launched their Project 'Pioneer Orientalists'. It aims at making online available the manuscripts in the collections of Joseph Justus Scaliger (d. 1609), Jacobus Golius (d. 1667), and others. The original manuscripts remain available in the reading room of the Leiden library for qualified readers. For readers with campus rights the electronic copies can be viewed free of charge. All other readers can view the images by paying a fee to Brill's. Other, similar projects are in preparation at this Leiden publisher. See the publisher's flyer, and website. Advisor to the project is Dr. Arnoud Vrolijk, the library's curator of Oriental Manuscripts and Rare Books. March 19, 2012: New publications from Tehran with relevance to the study of Islamic manuscripts. 1. Gozaresh-e Miras. Bimonthly Journal of Textual Criticism, Codicology and Iranology. vol. 47-48 (2011). See the table of contents. 2. 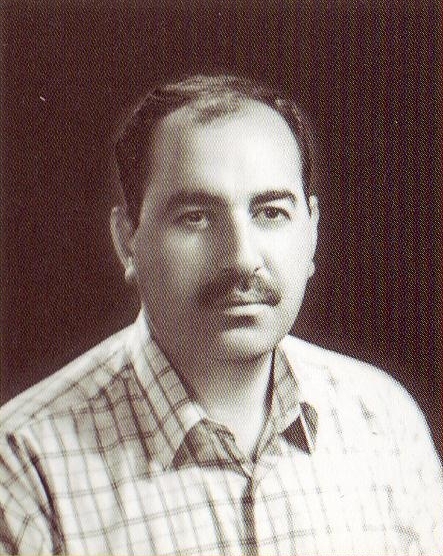 Masoud Ghasemi, Negahi be du chap-i 'aksi wa hurufi-yi Alinama. (A review of the Two Editions of 'Alinamah Facsimile and Edited Versions). = Ayene-yi Miras, Supplement No. 22. Tehran 2011. See the table of contents. 3. Ali Safari Agh Ghaleh, Nuskha shenakht. Pazhuheshnama-yi nuskha-shenasi-yi nusakh khattiyye-yi Farsi. Ba muqaddia-yi Iraj Afshar. (A Handbook of Persian Codicology. An Introduction to the Study of Persian Manuscripts). Tehran (Miras-e Maktoob) 2011. See the table of contents. January 13, 2012: New publication from Tehran with relevance to the study of Islamic manuscripts. 1. Jafar Aghayani-Chavoshi (ed. ), Studies on the History of Sciences from Antiquity to the XVII Century. Tehran (Miras-e Maktoob) 2011. See the cover, table of contents and introduction. 2. Sabine Schmidtke & Reza Pourjavadi, Sayyid Muhammad Mahdi al-Burujirdi al-Tabataba'i's (:"Bahr al-`ulum", d. 1212/1797) Debate with the Jews of Dhu l-Kifl. The Arabic and Persian versions. Edited and introduced by --. Tehran (Miras-e Maktoob) 2011. See the cover, table of contents and introduction. January 9, 2012: New publication on Islamic manuscripts from Tehran. We have just received from The Research Centre for the Written Heritage (Miras Maktoob), address: No. 1182, 2nd Floor, Farvardin Building, Between Daneshgah and Abureyhan St., Enghelab Ave. Tehran, I.R. Iran 1315693519 (P.O Box 13185-519), [contact or contact, website], a copy of the latest number of its Semiannual Journal of Bibliography, Book Review and Text Information, Mirror of Heritage (Ayene-ye Miras), vol. 48 (= New Series, vol. 9, Issue No. 1), 1390/2011 (ISSN 1561-9400). Managing director and editor-in-chief of this publication is Akbar Irani. See the cover, the table of contents and abstracts of No. 48. November 26, 2011: New publications on Islamic manuscripts from Tehran. We have just received from The Research Centre for the Written Heritage (Miras Maktoob), address: No. 1182, 2nd Floor, Farvardin Building, Between Daneshgah and Abureyhan St., Enghelab Ave. Tehran, I.R. Iran 1315693519 (P.O Box 13185-519), contact, website, a copy of Supplement 21 to its Bi-Quarterly Journal of Bibliography, Book Review and Text Information, Mirror of Heritage (Ayene-ye Miras), New Series, vol. 8, 1389/2010-2011 (ISSN 1561-9400). Managing director and editor-in-chief of this publication is Dr. Akbar Irani. See the cover and prelims of Supplement 21, entitled The Necessity of a New Edition of Nayshaburi's Qisas al-Anbiya, by Akram al-Sadat Haji Sayyid 'Aqayi. We also have just received from The Research Centre for the Written Heritage (Miras Maktoob) a copy of the latest number of its Monthly Journal of Textual Criticism, Codicology and Iranology, Heritage Report (Guzarish-i Mirath), vol. 46 of August-September 2011. Managing director and editor-in-chief of this publication is Dr. Akbar Irani. See the cover and the table of contents of No. 46. November 17, 2011: The first volume of a new catalogue of Arabisc manuscripts of the Bodleian Library in Oxford. Just published: Emilie Savage-Smith, A New Catalogue of Arabic Manuscripts in the Bodleian Library, University of Oxford. Volume I: Medicine. See the introduction and the table of contents. This includes (pp. xxix-xxxvi) 'The Arabic Collections in the Bodleian Library', by Colin Wakefield. October 10, 2010: New publication on Islamic manuscripts from Tehran. We have just received from The Research Centre for the Written Heritage (Miras Maktoob), address: No. 1182, 2nd Floor, Farvardin Building, Between Daneshgah and Abureyhan St., Enghelab Ave. Tehran, I.R. Iran 1315693519 (P.O Box 13185-519), contact, website, a copy of the latest number of its Bi-Quarterly Journal of Bibliography, Book Review and Text Information, Mirror of Heritage (Ayene-ye Miras), vol. 45 (= New Series, vol. 7, Issue No. 2), Autumn & Winter 2009-2010 (ISSN 1561-9400). Managing director and editor-in-chief of this publication is Akbar Irani. See the cover, the table of contents and abstracts of No. 45. July 28, 2010: Teaching materials for conservation course in Mauritania published. With the publication by the Centro regionale di catalogazione e restauro dei beni culturali (head conservation department: Mr. Alessandro Giacomello), address: Villa Manin di Passariano, esedra di ponente, I-33033 PASSARIANO di Codroipo UD, Italia, of the book by Alessandro Giacomello & Alessandro Pesaro (eds. ), Sauvegarde des bibliothèques du désert. Matériaux didactiques. Passariano (Centro di Catalogazione e Restauro dei Beni Culturali) 2009, important didactic materials for a course on the conservation of manuscripts in Mauritania have become available. The book (ISBN 978887445061-9) is published in French, has many illustrations in colour and contains cntribution by Carlo Federici, Alessandro Giacomello, Marcella Pellicanò, Gaia Petrella, Maria Luisa Russo and Giulio Zaccarelli. There is also an Arabic version available: Alessandro Giacomello & Alessandro Pesaro (eds. ), Inqadh Maktabat al-Sahra'. Mawadd Ta`limiyya. Passariano (Centro di Catalogazione e Restauro dei Beni Culturali) 2009 (without ISBN). To obtain a copy of either of these book, contact the publisher. Further information on the teaching project and on the Mauritanian counterparts is available from a folder (in English, Italian and French). July 16, 2010: Important new publication on Arabic manuscripts by Adam Gacek. Already in 2009 appeared with Brill's of Leiden Adam Gacek's newest work on Arabic manuscripts, the latest of many in a row: Arabic manuscripts. A vademecum for Readers. The 338 pages of this work read as an encyclopedia of the Arabic manuscript. The work is alphabetically arranged and gives important, often novel information on all aspects of the Arabic handwritten book. A conspicuous feature of the book is the great number of colour illustrations of details of Islamic bookmaking which the reader can find in a manuscript. Numerous drawings and a few charts complete this work that eloquently addresses both the beginner and the expert. See the cover, the table of contents and the preface. (ISBN 978 90 04 17036 0). Price: € 121.00 / US$ 179.00. July 8, 2010: Launch on the premises of The Royal Asiatic Society of Great Britain and Ireland of Barbara Brend's new book: Muhammad Juki's Shahnamah of Firdausi. London (The Royal Asiatic Society of Great Britain and Ireland / Philip Wilson Publishers) 2010. With a contribution by A.H. Morton. x, 214 pp., profusely illustrated in colour. ISBN 978-0-85667-672-7. 33.5 cm. Price £ 30.00. The Shahnama produced in the 1440's for Timur's grandson Muhammad Juki is one of the finest illustrated manuscripts of the period. In this study Barbara Brend for the first time analyses the thirty-one exquisite miniatures depicting scenes from the epic tale in great detail. A.H. Morton analyses the notes and seal prints that were discovered inside the backing of the manuscript. See the cover, the table of contents and the preface. July 1, 2010: New publication on Islamic manuscripts from Tehran. We have just received from The Research Centre for the Written Heritage (Miras Maktoob), address: No. 1304, 2nd Floor, Farvardin Building, Between Daneshgah and Abureyhan St., Enghelab Ave. Tehran, I.R. Iran 1315693519 (P.O Box 13185-519) a copy of the latest number of its Monthly Journal of Textual Criticism, Codicology and Iranology, Heritage Report (Guzarish-i Mirath), vol. 36 of December 2009 and January 2010 (ISSN 1561-9400). Managing director and editor-in-chief of this publication is Akbar Irani. See the cover and the table of contents of No. 36. June 14, 2010: New issue of the Iranian Journal for the History of Science. We have just received from The Institute for the History of Science of the University of Tehran (P.O. Box 13145-1836, Tehran, Iran) a copy of the latest number of its Journal, Tarikh-e Elm, No. 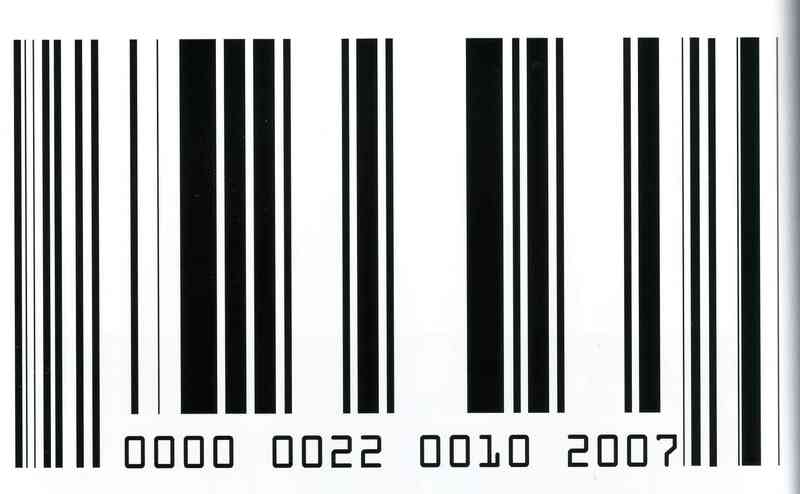 7, for 2008-2009 (ISSN 1735-0537). Editor-in-chief of this publication is Muhammad Baqiri (Mohammad Bagheri). See the cover and the table of contents of No. 7. June 12, 2010: New publication on Islamic manuscripts from Tehran. We have just received from The Research Centre for the Written Heritage (Miras Maktoob), address: No. 1304, 2nd Floor, Farvardin Building, Between Daneshgah and Abureyhan St., Enghelab Ave. Tehran, I.R. Iran 1315693519 (P.O Box 13185-519) a copy of the latest number of its Monthly Journal of Textual Criticism, Codicology and Iranology, Heritage Report (Guzarish-i Mirath), vol. 35 of October and November 2009 (ISSN 1561-9400). Managing director and editor-in-chief of this publication is Akbar Irani. See the cover and the table of contents of vol. 35. May 30, 2010: International Congress on the Codicology and History of the Handwritten Book in Arabic Script, Madrid 27-29 May 2010. From 27-29 May 2010 an international group of experts on manuscripts in Arabic script has held its conference in Madrid. Participants came from Egypt, France, Germany, India, Iran, Ireland, Israel, Italy, the Netherlands, Spain, Turkey, the UK, and the USA. The conference was hosted by the Centro de Ciencias Humanas y Sociales - Consejo Superior de Investigaciones Científicas, address: Calle Albasanz, 26-28. Madrid 28037 (Spain). Tel. : +34 91 602 23 00 Fax: +34 91 602 29 71 (website). The conference was organized by Prof. François Déroche (EPHE, Paris), Dr. Nuria Martinez de Castilla (CCHS-CSIC, Madrid) and Dr. Francis Richard (BULAC, Paris). It is the most recent conference of a series of international conferences which was initiated by François Déroche in Istanbul in 1986. The ideas behind the present conference can best be read in the call for papers as was sent around in the autumn of 2009. This call lead to an interesting and varied program. During the conference abstracts of the presentations were distributed. A decision how and where to publish the proceedings of this important conference will be taken by the organizers in the near future. May 21, 2010: Creation of a cataloguing system for fivehundred Islamic manuscripts in the Wellcome Library. The Wellcome Library, Bibliotheca Alexandrina and King's College, London have formed a partnership to create a free searchable on-line catalogue of 500 Islamic manuscripts in the Wellcome Library (London). This project will see the creation of a specialised cataloguing system which will allow 500 Islamic manuscript metadata and cover-to-cover images to be accessible online. A cataloguing system will be designed to create and manage descriptive metadata for Asian manuscripts, as well as a website to enable sophisticated access to the metadata and images. The overall aim of this project is to provide remote access to Islamic manuscripts via rich metadata and associated digital images. * The main output will be a specialised cataloguing system for Islamic manuscripts. This will help provide a standard for institutions holding Islamic manuscripts. * Catalogue records for 500 manuscripts. The organisation of this huge and important project could be an incentive to other libraries and therefore we herewith publish the details of the organisation of the project. May 21, 2010: Oxford & Cambridge Islamic manuscripts catalogue online. Since 2008-2009 a large project is underway to electronically improve scholarly access to descriptions of Islamic manuscripts held in the Bodleian Library (Oxford) and Cambridge University Library (OCIMOL). The joint project between the two libraries aims at making the descriptions of the Islamic manuscripts in the two libraries better accessible. These catalogue entries are kept in a number of catalogues, published over a period of more than two centuries, sometimes in a language (Latin) which is not widely known anymore. Some coordination was highly desirable. The organisation of this huge and important project could be an incentive to other libraries and therefore we herewith publish the details of the organisation of the project. May 18, 2010: Union Catalogue of Mathematical Manuscripts in Iran. We have just received a copy of the newly published Union catalogue of mathematical manuscripts in libraries in Iran: Fihristwara-yi Mushtarik-i Nuskha-hayi Khatti-yi Riyadi dar Kitabkhana-hayi Iran. Bi-Kushish-i Farid Qasimlu, Fariba Payrawand Thabit. Tehran (Danishgah-i Azad-i Islami) 1388 , 10 + 693 pp. On the basis of some 69 catalogues, lists and inventories of all sorts the two authors, Faris Ghassemlou and Fariba Sabet, man and wife in daily life and well-known bibliographers in Tehran, have compiled a highly useful survey of mathematical manuscripts. The list enumerating these sources is already impressive enough (pp. 9-19) and shows that bibliography in Iran is a serious activity. The Union catalogue is alphabetically arranged by title of each work, after which follows a short author's reference, and then the references to the library or libraries in which a copy of the work is preserved. Sometimes a short incipit is given. A few references to lithographic editions are included as well. Many of the texts described are in Arabic, and Persian is the language of the rest.The volume is concluded with an authors' index, an index of the titles, an index of class-marks (from which it becomes clear that there are references to c. 3400 manuscripts), and, finally, an index of (c. 170) references to texts on microfilms. It is evident that no serious student of the history of mathematics can do without this highly useful Union Catalogue of Mathematical Manuscripts in Libraries in Iran. See the covers, table of contents and the introduction of this volume. April 20, 2010: New publications from Iran on manuscripts and written heritage. We have just received from The Research Centre for the Written Heritage (Miras Maktoob), address: No. 1304, 2nd Floor, Farvardin Building, Between Daneshgah and Abureyhan St., Enghelab Ave. Tehran, I.R. Iran 1315693519 (P.O Box 13185-519) a copy of the latest volume in its series of supplements (New Series, Supplement No. 15), Tabari texts (Mutun-i Tabari), containing a number of texts from Tabaristan, edited by Habib Borjian. Apart from original contributions in Persian the volume also contains translated contribution, originally written by Aleksander Chodzko and A.K.S. Lambton. (ISSN 1561-9400). See the covers and the tables of contents of this volume. From the same Institute we received No. 44 (= vol. 7, issue 1) of the Institute's Quarterly Journal of Book Review, Bibliography and Text Information, Ayene-ye Miras. See the covers and the tables of contents of this volume. Of particular importance for the study of Islamic manuscripts is the newly published vol. 15 of Nama-yi Baharistan, year 10 (1388/2009) = No. 15 of the entire series. Beautifully produced, this volume contains a wealth of essays on a great variety of subjects. All texts are in Persian, and all are provided with a summary in English. The volume (price 7000 toman) can be ordered from the publisher The Library, Museum and Documentation Center of the Islamic Consultative Assembly, P.O. Box 11155-954, Tehran - Iran, tel. (+9821 6695 1919 / 6695 3224, fax: (+9821) 6646 9672. See the covers and the tables of contents of this volume. September 21, 2009: A new dictionary of terminology in connection with Islamic manuscripts. Just published: Hamid Reza Ghelichkhani, Farhang-i Wazhegan wa Istilahat-i Khushnawisi wa Hunar-hayi Wabasteh. Tehran, 2nd edition (Intisharat-i Ruzana) 1388/2009, 464 pp., price 6950 toman (22 cm, ISBN 978-964-334-013-1. Text in Persian, illustrated). English title: A Dictionary of Calligraphy and Related Arts. See cover and introduction (here). The first edition of this dictionary of terminology used in calligraphy and related arts appeared in Tehran in 1994. The second, greatly enlarged and completely rewritten, edition appeared in 2008. The edition which we have under review here seems to be a reimpression made in 2009. The author, Hamid Reza Ghelichkhani (born 1347/1968-1969), is head of the Calligraphy Departement in The Iranian Academy of the Arts in Tehran. Presently he is working, together with a group of calligraphy masters, on a series of biographies and studies on the works of great calligraphers, meant to be an elaboration and expansion of this work on terminology. The present dictionary is not the first work of its kind, nor will it be the last one. In the study of Islamic book arts Ghelichkhani's dictionary is certainly a landmark and its publication deserves more than casual attention. The dictionary is an integral work containing classical, traditional and modern terminology, the latter often of Western origin. This makes sense because calligraphy, and the other arts of the book for that matter, are enthoustically practiced in Iran nowadays where they enjoy a wide popularity, even more so - it would seem - than in the neighbouring countries of the Middle East. This does not only go for the modern practice of calligraphy in the educated layers of Iranian society, but also for the impressive heritage of Persian calligraphy. Calligraphy and book art have always been an outstanding Persian speciality, both within the political boundaries of present-day Iran and beyond, and Mr. Ghelichkhani's dictionary proves this once more. I am not aware of any other Islamic country where calligraphy plays such an important and all-pervasive role as in Iran, even to the extent that the two major writing styles, nasta`liq and the more difficult shikasteh, have come to be directly associated with Iranian culture. Writing well and beautifully is taught from early school years onwards, and in that sense Iran too can be called a calligraphic state (though in a somewhat different sense from Brinckley Messick's book of 1993 on the Yemen which goes by that title). So, far from describing a historical phenomenon, Ghelichkhani describes an old craft that is still vibrantly alive in present-day Iran. A look around in the bookshops opposite Tehran University will easily convince the scepticist. Shelvings full of books on calligraphic styles and techniques, supplemented by a generous supply of reed pens, inks, drawing papers and pen cases of all kinds, just prove the point. Knowing the terminology is knowing the field in which that terminology is used, and Ghelichkhani's dictionary is so attractively written and illustrated that it invites reading, not just looking for references. The dictionary's use is further enhanced by the inclusion of Persian-English and English-Persian glossaries. In all, some one-thousand terms and concepts are treated, sometimes with succinct, very matter-of-fact explanations, but sometimes with descriptions that verge on the encyclopaedic. The book is well-illustrated, in black-and-white, the illustrations showing not only images from both Iranian and foreign manuscript collections, but also objects and instruments which are important to calligraphy and the art of the Islamic book. September 19, 2009: Sotheby's auction 'Arts of the Islamic World', London 7 October, 2009. The half-yearly auction of Sotheby's, London, of Islamic manuscripts and Islamic art is held on 7 October 2009. The catalogue, lavishly illustrated as always, is just out. See the first items in the (catalogue). The first number in the catalogue is a collection of 59 Arabic papyri. This is remarkable, because one sees these rarely come for sale nowadays. The auction also comprises a number of remarkably old scholarly and scientific manuscripts, among other things a 12-13th century copy of al-Ghazzali's Ihya' `Ulum al-Din (No. 14), a treatise on chess from North Africa, datable to the 13th century (No. 16), the Masa'il fil-Tibb lil-Muta`allimin by Hunayn b. Ishaq, dated 496/1102. This latter manuscript also contains a few notes in Hebrew (No. 17). Two manuscripts with texts by Nasir al-Din al-Tusi (d. 672/1274) stand out as well. There is a manuscript of the Kitab al-Mutawassitat, the 'Compendium of Intermediate books' with colophons dated 682/1283 and 706/1306 (No. 21), and there is an early copy (in safina shape) of the Tahrir Usul Uqlidis, Tusi's edition of Euclid's Elements, with an estimated date of completion of c. 1280 AD (No. 22). All these manuscripts are described in a thorough and scholarly way in the catalogue. As usual there are also Persian and Indian miniatures, historical instruments, Qajar painting, weapons, sculpture and textiles. See the (online) version of entire illustrated auction catalogue. September 10, 2009: Just published: a study on and an edition of one of the oldest manuscripts of the Qur'an. Professor François Déroche (Paris, École des Hautes Études Pratiques) has published with Brill's of Leiden & Boston a monograph on one of the oldest Qur'an manuscripts extant. This is mainly MS Paris, BnF, Arabe 328 a, but fragments of what was sometime one and the same codex as the Paris manuscript are now also preserved in the National Library of Russia (St. Petersburg), the Vatican Library and the David N. Khalili Collection in London. The Paris fragments had already been published in full-colour facsimile by Sergio Noja Noseda and François Déroche in the course of 1998. In his La transmission écrite du Coran dans les débuts de l'Islam. Le codex Parisino-petropolitanus. Leiden & Boston (E.J. Brill) 2009 [ISBN: 978 90 04 17272 2, ISSN: 1567-2808], Prof. François Déroche describes the acquisition history of the fragments, and he further gives a detailed description of the codicological and orthographic details of the manuscript. He adds to his important observations (in French) a full edition of the fragments. In his edition Déroche reproduces the rasm of the text exactly as it is preserved in the manuscript. As point of departure for that edition he has taken the Cairo edition of the Qur'an. The quasi-total absence of diacritics and other reading signs in Déroche's edition is an exact rendition of the written text as preserved in the manuscript. It is the first time in the history of Qur'anic studies that such an edition has been produced. It is a first step towards a critical edition of the Qur'an. Such a critical edition is an old plan in Western Islamic studies, and the completion of it will take make more years. See Déroche's English summary here (pdf). See the publisher's (website). See for f. 10b of the Paris manuscript (here) and see for the latter part of the corresponding page and the beginning of f. 11a in Déroche's edition of the text (here). July 31, 2009: Persian documents of the Safawid era in the Matenadaran, Yerevan, Armenia, described and published. Dr. K.P. Kostikyan, Persian documents in the Matenadaran. Decrees. Volume 3 (1652-1731). Yerevan (Institute of Oriental Studies) 2005, 728 pp., illustrations (ISBN 99941-1-105-1). The book is available from the publisher, the Institute of Oriental Studies in the National Academy of Sciences of the Republic of Armenia, Yerevan. Price not known. Our attention was recently drawn to volume 3 of an illustrated edition, with translations (one in Armenian, one in English) of the Persian documents kept in the Matenadaran in Yerevan, the National Manuscript Library of the Republic of Armenia (Address: 53 Mesrop Mashots Avenue, Yerevan, Republic of Armenia). The Matenaderan, that great repository of manuscripts, contains more than the precious Armenian manuscripts for which it righly enjoys a great fame all over the world. There is, among other things, also an important collection of Persian documents and manuscripts. This is in fact less amazing than one would think since the country that we now know as Armenia has been part of Iran for a long time. Part of Armenia's history is therefore written in Persian. That we now know a bit more about this is the merit of Dr. Kristine P. Kostikyan who four years ago published her Persian documents in the Matenadaran. Decrees. Volume 3 (1652-1731). As publications from Armenia are not easy to obtain, and since one must first know that they exist at all, we are glad to mention this important work here, even if it is not a very recent publication. The two volumes that have already been published in this series were done by the Armenian scholar H. Papazian, the first in 1956 (vol. 1, containing twenty-three decrees dated 1449-1594), then the second in 1959 (vol. 2, containing forty-three decrees dated 1603-1650). Papazian's work was published in Armenian, so that it went largely unnoticed. This third volume by Dr. Kostikyan, a pupil of Papazian, has come out in 2005, and it has by its use of the English language a more international appeal. It treats ninety documents which were issued in the period between 1652-1731. The documents that are contained in the third volume date from the reigns of the Safawid Shahs Abbas II, Sulayman, Sultan Husayn and Tahmasp II. The land that we now call Armenia was at the time by and large part of Azarbaijan, then a province of Persia, as was the name of Iran then. These historical circumstances in the Matenadaran tell a remarkable tale, since most of them describe cases and questions between Christian Armenians and their Muslim rulers. When the central authority of the Safawid state gradually wained, problems between Christians and Muslim increased correspondingly and these found their way in the documents here described. But that is not all. Apart from the increasing intolerance of Muslim clergy, the Armenian Christians were at the time also targeted by Roman Catholic missionary activities. As missionaries from Rome are strictly forbidden, till today, to try to convert Muslims, they often turn to other Christian denominations in the region and make an effort to convert these to submission to the Holy Father in Rome, and not always without success. Every soul counts. The collection of documents which has now been published (edition of the Persian texts, translations in Armenian and English, reproductions of the originals, unfortunately not of the best graphical quality) by Dr. Kristine Kostikyan, tells this story. Each document focusses on a particular and isolated case, but together they provide a more general image. It is the merit of Dr. Kostikyan to show that image by her exempary work on this difficult material. The book is divided into three parts. Pp. 1-221 are Armenian translations of the Persian documents which are described in this volume. Most readers outside Armenia will therefore start from p. 222 onwards. There they will find an erudite historical introduction (pp. 223-242). Then follow the annotated translations of the ninety documents (pp. 243-378), which in turn are followed by a glossary of fiscal, social and administrative terminology (pp. 379-388). Then follows the edition of the Persian texts together with the reproductions of all documents (pp. 389-707). The book is concluded by a highly useful index (pp. 708-719) and an annotated table of contents (pp. 720-728). The author of this important collection of documents, Dr. Kostikyan of the Institute of Oriental Studies in Yerevan, is presently preparing a catalogue of the Persian manuscripts in the Matenaderan. June 2, 2009: Calligraphy exhibition in the Sharjah Museum of Islamic Civilization. From April 29 till September 26 the Sharjah Museum of Islamic Civilization organizes the exhibition "Eternal Letters: From the Abdul Rahman Al Owais Islamic Calligraphy Collection, Sharjah". Read the article by Mariam M. Al Serkal, "Sharjah museum hosts rare calligraphy show" posted on May 29, 2009 in Gulfnews.com: (pdf). See the press release on the opening of the exhibition of pieces from the Abdul Rahman Al Owais Islamic Calligraphy Collection posted on June 2, 2009 in the Arab Media Forum Agenda of 2009 as published by the Sultan Bin Ali Al Owais Cultural Foundation: (pdf). Address of the museum: Sharjah Museum of Islamic Civilization, PO Box 39939, Sharjah, UAE. Tel:+ 971 6 5655455 - Fax: + 971 6 5652988 - contact. How to visit: The Sharjah Museum of Islamic Civilization is located on the Corniche Street in al-Majjarah Area. It is situated on the opposite side of the Corniche Street from Sharjah Creek, and is highly visible due to its size and gold dome. Ample parking is available behind the museum, accessible from Gulf Road. March 6, 2009: Publications of the Kufic Encyclopedia in Tehran. The founder and author of the Kufic Encyclopedia in Tehran (Kufic Encyclopedia, P.O. Box 16765-1776, Tehran, Islamic Republic Iran, telephone +60123245737, contact, website), is Seyed Mohamad Vahid Mosavi Jazayeri (portrait). He was born in 1969 in Iran. He majored in graphics and in 1994 he graduated from university. In 1988 he took up learning classic calligraphy (Naskh and Thuluth) from masters of these styles. In 1993 he started teaching the same styles at a professional level at the 'Calligraphers' Society of Tehran'. In 1992 he began researching on the Kufic script and practically experienced Kufic calligraphy. It was in 1994 when he managed to discover the special pen or quill for writing in the primary Kufic style. Then he taught Kufic style at universities for three years. Mosavi Jazayeri SMV has been able to design over three thousand logotypes and several fonts which enjoy modern visual capabilities. In each special topic in this volume (one-word or multiple-word) what has been considered greatly is creating characters in a variety of forms with utmost capabilities. He has also invented a new methodd to invert designing Persian logotypes (as an exclusive word) to designing characters. He has also taught for two years the course 'Designing Persian Letters and Logotypes' to students majoring in graphics at technical schools. His orientation as a calligrapher, and his knowledge of graphics enabled him to design Latin characters and logotypes as well. One of his achievements in this field creating two unique 'Latin fonts with oriental qualities of calligraphy', showing his experience and ability in classical Latin calligraphy. He has won several awards in different festivals; he has also displayed his artistic works in a number of exhibitions both individually and in group work (from the introduction to Kufic Encyclopedia. First Volume. "Learning how to write the primary Kufic style of calligraphy", Tehran 2006. This work contains numerous illustrations of old 'Kufic' specimens and what is possibly the most interesting, a description of how to write Kufic script as devised and reconstructed by Mr. Jazayeri. See the beginning (p. 123) of the instruction manual for writing Kufi script. References to and samples of other work by Mr. Jazayeri can be found in a beautifully printed bibliography or catalogue: About published calligraphic works. Tehran 2008. Other works by Mr. Jazayeri include: Seventh Heaven, an album of 18 designs in connection with the basmala, further Divine Love, an album with Kufic specimens, then also Messiah of Souls, an album of Kufic, Naskh and Thuluth calligraphy, and logotype designs, and finally Diffusing Musk, an album of calligraphy. Other works are in preparation. March 5, 2009: New publications from the Juma al-Majid Center in Dubai on Islamic manuscripts. - Akhbar al-Markaz, year 6, No. 36 (Dhu al-Higga 1429 / December 2008). See for the covers and the table of contents (pdf). - Afaq Al Thaqafa wa'l-Turath, a Quarterly Journal of Cultural Heritage, vol. 16, No. 64 (Muharram 1430 / January 2009). See for the covers, the table of contents and abstracts (pdf). 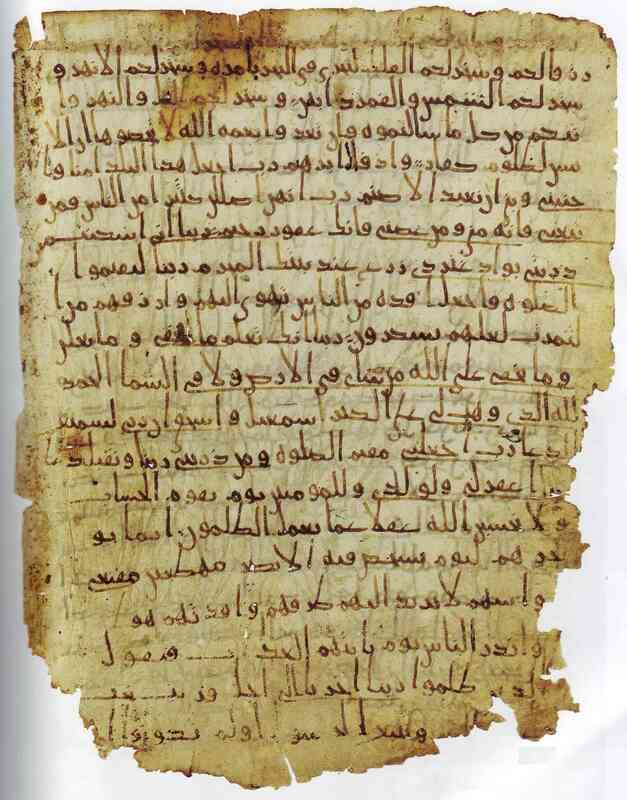 March 4, 2009: Two new articles on Arabic papyri by Petra M. Sijpesteijn. - 'A seventh/eighth-century list of companions from Fustat', in: F.A.J. Hoogendijk and B.P. Muhs (eds. ), Sixty-Five Papyrological Texts. Presented to Klaas A. Worp on the Occasion of his 65th Birthday. Leiden (E.J. Brill) 2008, pp. 369-377. (Papyrologica Lugduno-Batava, 33) (pdf). - 'Landholding Patterns in Early Islamic Egypt', in Journal of Agrarian Change, 9/1 (January 2009), pp. 120-133 (pdf). February 22, 2009: Facsimile edition of a newly-discovered manuscript on the history of Herat. Just appeared: History of Herat (a newly-discovered manuscript). Probably by Shaykh 'Abd al-Rahman Fami Hiravi (472-546 A.H. / 1079-1152). The Facsimile in the Original Size of the Manuscript from the Personal Library of Dr. Mohammad Hasan Mirhosseini. Copied in the 13th Century. Introduction by: Mohammad Hasan Mirhosseini, Mohammad Reza Abouyi Mehrizi. Preface: Iraj Afshar. Tehran (Miras-i Maktub) 1387 (2008). 44, 180, 7 pp. (ISBN: 978-964-8700-48-0). Available from The Research Centre for the Written Heritage (Miras Maktoob), address: No. 1304, 2nd Floor, Farvardin Building, Between Daneshgah and Abureyhan St., Enghelab Ave. Tehran, I.R. Iran 1315693519 (P.O Box 13185-519). The facsimile edition was published in cooperation with the Iranian National Commission for UNESCO and the Association for the Study of Persianate Societies (ASPS). The facsimile of the History of Heran (in Persian) is printed in full-colour. See for the title-pages, table of contents, preface and a sample of the facsimile edition (pdf). February 22, 2009: New publication on Islamic manuscripts from Tehran. We have just received from The Research Centre for the Written Heritage (Miras Maktoob), address: No. 1304, 2nd Floor, Farvardin Building, Between Daneshgah and Abureyhan St., Enghelab Ave. Tehran, I.R. Iran 1315693519 (P.O Box 13185-519) a copy of the latest two numbers of its Monthly Journal of Textual Criticism, Codicology and Iranology, Heritage Report (Guzarish-i Mirath), vol. 25-26 of October and November 2008, and vol. 27-28 of December 2008 and January 2009. (ISSN 1561-9400). See the cover and the table of contents of vol. 25-26. And See the cover and the table of contents of vol. 27-28. From the same Institute we received also the Cumulative Index of all articles which have appeared in vols. 1-42 (1377-1387/1998-2008) of the Institute's Quarterly Journal of Book Review, Bibliography and Text Information, Ayene-ye Miras. See the cover and the table of contents of this Index, together with the preface by the Institute's director, Dr. Akbar-i Irani. February 22, 2009: An encyclopedia on Islamic calligraphy and illumination. Dr. Hasan Özönder Karaman Caddesi No. 78, Konya (Turkey) is the author of an interesting encyclopedia (in Turkish) of the arts of calligraphy and illumination, Ansiklopedik hat ve tezhip sanatlari deyimleri, terimleri sözlügü. Konya 2003. The work seems to be privately published and is also available from Uysal Kitabevi, Cumhuriyet Alani, 8/A 42200 Meram, Konya, Turkey, and from the major bookshops in Turkey (ISBN: 975-94341-2-1). See the front cover. February 10, 2009: New publication on Islamic Codicology. Just published: Stefanie Brinkmann & Beate Wiesmüller (eds. ), From Codicology to Technology. Islamic Manuscripts and their Place in Scholarship. Berlin (Frank & Timme GmbH Verlag für wissenschaftliche Literatur) 2009. 215 pp., many colour illustrations. Price € 29.80 (ISBN 978-3-86596-171-6). The articles in the volume are based on the lectures given at the panel 'Islamic Manuscript - Projects and Perspectives' at the Congress of German Oriental Studies, Freiburg im Breisgau (Germany), 24-28 September 2007. See the cover. Islamic manuscripts are voices from the past, revealing scholarly debates and networks, as well as aspects of daily life. They allow us to witness the transmission of knowledge and economic and cultural exchanges of centuries gone by. The present articles mirror this variety of aspects involved when dealing with Islamic manuscripts, and emphasize their importance as sources for our knowledge of history. The articles cover research on single manuscripts, as well as collections, the problems of editing, as well as cataloguing. New technologies have extended the possibilities of preserving and presenting manuscripts - accessible online, digitised and catalogued, they serve an international research community and become a worldwide cultural heritage. Stefanie Brinkmann is lecturer at the Institute of Oriental Studies at Leipzig University, Germany. She is active as team member of projects on Islamic manuscripts held at Leipzig University Library. Educated in Arabic and Persian Studies, as well as Italian Philology, she holds a PhD in Arabic Studies. Beate Wiesmueller has been research associate in projects on cataloguing Islamic manuscripts and Oriental rare books. Since 2006 she is research associate in Leipzig for projects on Islamic manuscripts. She has authored several publications on Oriental collections and holds a M.A. in Islamic Studies, English Philology and Comparative Religious Studies. January 29, 2009: Exhibition on Islamic calligraphy in the Asia Society Museum, New York, October 7, 2008 - February 8, 2009. Two complementary exhibitions at Asia Society Museum explore Islamic art's quintessential art form, calligraphy. Traces of the Calligrapher: Islamic Calligraphy in Practice, c. 1600-1900 and Writing the Word of God: Calligraphy and the Qur'an demonstrate the breadth and beauty of Islamic calligraphy and the traditions of its practice across several centuries and two continents. ¶ Together, these exhibitions examine the artistry of the tools used to create masterful works, examples of calligraphy, such as practice exercises, manuscripts, and folios from the Qur'an, and the social prestige associated with calligraphy. Approximately 150 objects and works from an important private collection in Houston, from the Arthur M. Sackler Museum, Harvard University Art Museums, and the Morgan Library & Museum, convey the elegance of the esteemed art form and reveal the skills of the many artisans�calligraphers, paper makers, gold beaters, illuminators, bookbinders, and metalworkers, to name a few�involved in the creation of the tools, the calligraphies, and the manuscript folios. ¶ The practice of calligraphy constituted an expression of piety, as stated in the hadith (associated with the Prophet Muhammad): "the first thing created by God was the pen." Calligraphy became a worthwhile endeavor for men of all stations and served as a permanent record of the calligrapher's character. ¶ Traces of the Calligrapher maps the practice of the calligrapher from the seventeenth through the nineteenth centuries both through examples of calligraphy as well as through tools of the trade. The objects in the exhibition come from Iran, Turkey, and India, and include reed pens, penknives (used to cut the nib of the pen), and maktas (used to hold the pen during this process), in addition to inkwells, scissors, burnishers, storage boxes, and writing tables. ¶ The fine craftsmanship of these objects is revealed in the exquisite and detailed designs, which often employ precious materials such as jade, agate, ivory, ebony, silver, and gold. Calligraphic practice exercises and fair copies are displayed alongside these implements, and a video shows a master calligrapher at work. Together, the objects and their output present a comprehensive overview of the intimate world of the calligrapher and the environment in which he worked. ¶ Writing the Word of God: Calligraphy and the Qur'an is devoted to key developments of the Islamic scripts of distinct cultural areas, spanning from Spain and North Africa to Greater Iran from the seventh to the fifteenth centuries. A selection of approximately twenty folios from now dispersed Qur'ans from the regions will illustrate the rich variety and system of scripts. Traces of the Calligrapher and Writing the Word of God have been assembled by guest curators Mary McWilliams, Norma Jean Calderwood Curator of Islamic and Later Indian Art at the Arthur M. Sackler Museum, and David J. Roxburgh, Prince Alwaleed bin Talal Professor of Islamic Art History at Harvard University. In Houston, Christine Starkman, curator of Asian art, and Vivian Li, curatorial assistant in the Asian art department, oversaw the presentation. At Asia Society, the in-house curator and coordinator is Adriana Proser, John H. Foster Curator of Traditional Asian Art. The exhibitions are organized by the Museum of Fine Arts, Houston, and Harvard University Art Museums. Generous support is provided by Mr. and Mrs. Vahid Kooros; The Hagop Kevorkian Fund; Mr. and Mrs. Ali Ebrahimi; Douglas Jaffe III � Horseshoe Bay Resort; Mr. and Mrs. Pat R. Rutherford, Jr.; The Seaver Institute; Fariba and Rainer Buchecker; and Mr. Kay-Ghobad "Kiddie" Zafar. The exhibitions are presented at Asia Society as part of Creative Voices of Islam in Asia, a three-year initiative funded in part by the Doris Duke Foundation for Islamic Art. The exhibition Traces of the Calligrapher: Islamic Calligraphy in Practice, c. 1600-1900 is accompanied by an illustrated catalogue written by McWilliams and Roxburgh and published by the MFAH. The exhibition Writing the Word of God: Calligraphy and the Qur'an is accompanied by an illustrated catalogue, written by David J. Roxburgh. Both catalogues are published by MFAH and are available for sale at AsiaStore at Asia Society Museum. Asia Society is the leading global and pan-Asian organization working to strengthen relationships and promote understanding among the people, leaders and institutions of the United States and Asia. Founded in 1956 by John D. Rockefeller 3rd, Asia Society is a nonprofit educational institution with offices in Hong Kong, Houston, Los Angeles, Manila, Melbourne, Mumbai, New York, San Francisco, Seoul, Shanghai, and Washington, DC. ¶ Asia Society Museum presents groundbreaking exhibitions and artworks, many previously unseen in North America. Through exhibitions and related public programs, Asia Society provides a forum for the issues and viewpoints reflected in both traditional and contemporary Asian art. ¶ Asia Society and Museum, 725 Park Avenue (at 70th Street), New York City. The Museum is open Tuesday through Sunday from 11:00 am to 6:00 pm and Friday from 11:00 am to 9:00 pm. Closed on Mondays and major holidays. General admission is $10, seniors $7, students $5, and free for members and persons under 16. Free admission Friday evenings, 6:00 to 9:00 pm. - E. Atil & Michael Monroe, Mohamed Zakariya, Islamic Calligrapher. Bellevue Arts Museum, 2006. See announcement. - Sheila S. Blair, Islamic Calligraphy. Edinburgh University Press, 2008/Columbia Univ Pr, 2006. See announcement. - Gabriel Mandel Khan, Rosanna M. Giammanco, Arabic Script: Styles, Variants and Calligraphic Adaptations. Abbeville Press, Incorporated, 2006. See announcement. - Fahmida Suleman (ed. ), Word of God, Art of Man. The Qur'an and its Creative Expressions. Oxford (OUP) 2008. See announcement. January 28, 2009: Catalogue of the Oriental manuscripts of Josephus Justus Scaliger (1540-1609). On 21 January 2009 it was exactly four hundred years ago that Josephus Justus Scaliger, Europe's greatest philologist and humanist scholar, died in Leiden. The Leiden University Library, where since 1609 the manuscripts and part of the printed books of Scaliger are kept has organized, together with Scaliger Institute in Leiden, an exhibition of Scaliger's Oriental collections. A beautifully printed catalogue was pubished at the occasion: Arnoud Vrolijk & Kasper van Ommen (edd. ), "All my Books in Forein Tongues". Scaliger's Oriental Legacy in Leiden 1609-2009. Catalogue of an exhibition on the quatercentenary of Scaliger's death, 21 January 2009. With an introductory essay by Alastair Hamilton. Leiden (Leiden University Library) 2009 (131 pp., all illustrations in full colour). See the title-page of the catalogue. The authors of the descriptions of manuscripts and printed books in this catalogue are: Theodor Dunkelgrün, Anthony Grafton, Toon van Hal, Alastair Hamilton, Albert van der Heide, Jan Paul Hinrichs, Henk Jan de Jonge, Robert M. Kerr, Kasper van Ommen, Karin Scheper, Jan Schmidt, Arnoud Vrolijk, Edwin Wieringa and Jan Just Witkam. The catalogue can be ordered from The Scaliger Institute, c/o Mr. Kasper van Ommen, Leiden University Library, P.O. Box 9501, NL-2300 RA Leiden, The Netherlands, at the price of € 15.00 plus postage. December 22, 2008: A Handlist of the Islamic manuscripts in the Parliament Library in Tehran. Just published: Sayyid Muhammad Tabataba'i Behbehani (Mansur), Fihrist-i Mukhtasar-i Nuskha-hayi Khatti-yi Kitabkhana-yi Maglis-i Shura-yi Islami. Teheran 1386 , 1305 pp. (ISBN: 964-6690-62-9). ¶ This is a handlist of the Islamic manuscripts in the Library of the Maglis-i Shura-yi Islami, the Library of Parliament, in Tehran. The handlist is arranged alphabetically by title of each text and refers to library's class-marks. The 8710 descriptions are of minimal proportion in order to facilitate the use of this handlist. The title section is followed by several indexes (by subject, by author, by place of copying, by copyist). At the end a survey is given of the library's ambitious publication program. See the prelims and the author's preface. December 22, 2008: New publication on Islamic manuscripts from Tehran. We have just received from The Research Centre for the Written Heritage (Miras Maktoob), address: No. 1304, 2nd Floor, Farvardin Building, Between Daneshgah and Abureyhan St., Enghelab Ave. Tehran, I.R. Iran 1315693519 (P.O Box 13185-519) a copy of the latest number of its Quarterly Journal of Book Review, Bibliography and Text Information, Mirror of Heritage (Ayene-ye Miras), New Series, vol. 6, issue 3 (= No. 42) of Winter 2008. (ISSN 1561-9400). See the table of contents of No. 42. December 9, 2008: Catalogue of Islamic manuscripts in the Ali Hasjmy Collection, Banda Aceh, Indonesia, published. Within the framework of the Aceh Project for the Preservation of Cultural Heritage, organized by Tokyo University of Foreign Studies (TUFS), Centre for Documentation & Area-Transcultural Studies, address: 3-11-1, Asahi-cho, Fuchu-shi, TOKYO 183-8534, Japan, website, a catalogue of the Acehnese manuscripts in the Ali Hasjmy Collection, a private collection, has been published: Oman Fathurahman & Munawar Holil, Katalog Naskah Ali Hasjmy Aceh. Catalogue of Aceh Manuscripts: Ali Hasjmy Collection. Tokyo 2007 (ISBN 978-4-925243). See the preliminaries and the indexes (pdf) of the catalogue. Most manuscripts described in the catalogue are in Arabic and Malay. A relatively small number of texts is in the Acehnese language. The catalogue is arranged according to subject: Qur'an, Hadith, Tafsir, Tawhid, Fiqh, Tasawwuf, Grammar, Dhikr and Du'a', Hikayat, other texts. The descriptions are extensive, with ample literary and codicological detail. Many manuscripts have been illustrated. The catalogue is preceded by a Foreword by Prof. Sugahara Yumi and a Peface by Prof. Edwin Wieringa (Professor of Languages and Cultures of Indonesia and the Study of Islam in the University of Cologne, Germany). The publication of the catalogue is the result of co-operation between the following institutions: Yayasan Pendidikan dan Museum Ali Hasjmy, Banda Aceh; Pusat Pengkajian Islam dan Masyarakat (PPIM) UIN Jakarta; Masyarakat Pernaskahan Nusantara (MANASSA); Centre for Documentation and Area-Transcultural Studies (C-DATS) of Tokyo University of Foreign Studies (TUFS). ¶ Press release by TUFS (2005): The Great Earthquake and Indian Ocean Tsunami on 26 December 2004 resulted in the death and missing of nearly three hundred thousand people around the Indian Ocean. We would like to offer our condolence to those on their bereavement. As part of our effort to help the people in Aceh to restore and preserve their cultural heritage, especially those in the form of written documents, the Aceh Project for the Preservation of Cultural Heritage was initiated in March 2005. December 8, 2008: The second-oldest dated Persian manuscript published in facsimile. In Tir 1387 (June-July 2008) the second-oldest dated Persian manuscript was published in a facsimile edition. This is the work Hidayat al-Muta'allimin fil-Tibb, a medical compilation by Abu Bakr Rabi' b. Ahmad al-Akhawayni al-Bukhari, who must have conceived that work sometime before 370/981 as a medical textbook for his son. The manuscript is preserved in Oxford (Bodleian Library) as MS Pers. c. 37, and is dated beginning Rabi' I 478 (1085, colophon on p. 661). The present facsimile was edited by Iraj Afshar, Mahmud Omidsalar and Nader Mottalebi Kashani. It is the first volume in a new series Folia Medica Iranica. The present volume could be published thanks to generous subsidy by the Bonabi family. This new facsimile edition (ISBN 978-964-96998-6-8) was published in 500 copies by Bahram Publishers in Tehran. The book is available from the well-known Tehran Bookshop Tahouri, Khiyabane Enghelabe Eslami No. 1348 (opposite Tehran University), P.O. Box 13145-1648, Tehran, I.R. Iran (tel. 6640 6330). To the facsimile edition of the manuscript are added several useful introductions. First there are the codicological observations by Mahmud Omidsalar on the Oxford manuscript (pp. 5-10, in English [pdf]). The introductory part on the Persian side of the volume is much more extensive: First there is an essay on the position of the Hidayat al-Muta'allimin in the history of medicine (pp. 7-16, by Dr. Ghulamreza Bonabi. Then follows a detailed and important codicological introduction (pp. 17-37) by Iraj Afshar. This is followed by a short anonymous survey of the reception history of the Hidayat al- Muta'allimin ever since Charles Rieu mentioned, in 1895, the existence of the manuscript in his catalogue of the Persian manuscripts in the British Museum (pp. 39-40). This is followed (pp. 41-42) by a re-edition of the notes by that great philologist of Persian literature, Muhammad Qazwini, taken from vol. 9 of his Memoirs. Then follows a note by Mujtaba Minovi (pp. 43-46), which was taken from an article in Yaghma, which is followed on pp. 47-48 by the text of a letter from Mehdi Bayani to Mojtaba Minovi, taken from the same No. of Yaghma. This is followed (p. 49) by the Persian translation (by Dr. Minuchihr Mortazawi) of an extract of a study by Gilbert Lazard on the Soghdian terminology in the Hidayat al-Muta'allimin. On pp. 50-54 follows the essay by Gilbert Lazard on the Hidayat al-Muta'allimin in the Persian translation by Leila 'Askari. On pp. 55-57 is a survey by Dr. Jalal Matini of some of the grammatical peculiarities of the text of the Hidayat al-Muta'allimin. The Persian introductory part of the facsimile edition is concluded by text which was omitted in the Meshhed edition of the Hidayat al-Muta'allimin (p. 58, provided by Nader Mottalebi Kashani), a list of coloured chapter titles in the Oxford manuscript (pp. 59-60, by Iraj Afshar), an introduction to another manuscript of the Hidayat al-Muta'allimin, MS. Tehran, Malek Library No. 4501 (pp. 61-62, by Iraj Afshar), and on pp. 63-66 is a comparison by Nader Mottalebi Kashani between the two manuscripts (Bodleian and Malek), with two photographs taken from the Malek manuscript. Finally follows the facsimile edition of the second-oldest manuscript in the Persian language (668 pp., in in black and white). ¶ As is well-known, the oldest dated Persian manuscript is al-Abniya 'an Haqa'iq al-Adwiya by Abu Mansur Muwaffaq al-Din b. 'Ali al-Harawi, the original of which was copied by 'Ali b. Ahmad Asadi Tusi (the author of Lughat-i Furs), and which is now preserved in the Library of the Austrian Academy of Sciences in Vienna. Several editions of that text exist, and in 1974 Manuchihr Amiri published a dictionary of the medical terminology of that text. December 7, 2008: Judeo-Arabic manuscripts in Sotheby's auction, New York, 17 December 2008. No. 195. Commentary on Alfasi's Halakhic code on Hullin, Hebrew manuscript on vellum. [Yemen, 13th century]. (description and illustration of 102-103 and 159). No. 196. Al-Mansuri (A treatise on medicine), Abu Bakr Muhammad b. Zakariya al-Razi (Rasis), with several other medical texts by Hunayn b. Ishaq, Maimonides, and others, in Judeo-Arabic. Manuscript on paper [Yemen, 13th century] (description and illustration of 98 and 122-123). No. 197. Deuteronomy, in Hebrew, with Targum and Judeo-Arabic translation. Manuscript on vellum. [Yemen, 14th century] (description and illustration of 26-27). No. 198. Haftarot ha-Torah, with Targum, Hebrew manuscript on vellum. [Yemen, 14th century] (description and illustration of 110-111). No. 199. Haftarot ha-Torah, with Targum, Hebrew manuscript on parchment. [Yemen, 14th century] (description and illustration). No. 200. Midrash ha-Hefez (Midrashic commentary on Pentateuch and Haftarot, in Judeo-Arabic, Zachariah ben Solomon-Rofe. Manuscript on paper. [Yemen:] completed 4 February 1500 (description and illustration of 138-139). No. 206. Hebrew letter to the Jewish community of Kai-Fung-Foo (Kaifeng), endorsed in Chinese, Isaac Faraj ben Reuben ben Jacob, Manuscript on paper. Shanghai, 31 October 1850 (description and illustration). Note that several of these manuscripts originate from the collection of David Solomon Sassoon (1880 - 1942). November 18, 2008: Publication of volume 14 of the Journal for the History of Arabic Science. Prof. Dr. Moustafa Mawaldi, Director of the Institute for the History of Arabic Science (Aleppo University, Aleppo, Syria, tel. +963 21 22 38 170, fax: +963 21 26 32 162, email: ihas@alepuniv.shern.net), announces the publication of volume 14 of the Institute's Journal for the History of Arabic Science. See the text of the announcement and a survey of this volume's contents (pdf). November 17, 2008: New publications on Islamic manuscripts from Tehran. We have just received from The Research Centre for the Written Heritage (Miras Maktoob), address: No. 1304, 2nd Floor, Farvardin Building, Between Daneshgah and Abureyhan St., Enqelab Ave. Tehran, I.R. Iran 1315693519 (P.O Box 13185-519) Nos. 19-20 and Nos. 21-22 of its Monthly Journal of Textual Criticism, Codicology and Iranology Heritage Report (Gozaresh-e Miras) of April-May 2008 and June-July 2008 respectively. See the table of contents and abstracts of Nos. 19-20, and see the table of contents and abstracts of Nos. 21-22. We have also just received from the same Institution a copy of its Quarterly Journal of Book Review, Bibliography and Text Information, Mirror of Heritage (Ayene-ye Miras), New Series, vol. 6, issue 1 (= No. 40) of Spring 2008, and vol. 6, issue 2 (= No. 41) of Summer 2008. (ISSN 1561-9400). See the table of contents of No. 40 and see the table of contents of No. 41. November 12, 2008: Arabic version of a classic of Dutch literature discovered. Recently, Prof. Herman Teule, chair of Oriental Christianity in the Catholic Radboud University of Nijmegen, The Netherlands, discovered the Karshuni version of a classic of medieval Dutch literature. This classic is the story of Marieken of Nimwegen, a miracle play which was first published in Antwerp in or around 1515. The storyline is this: Marieken ('Little Mary'), a young woman from Nimwegen, lets herself be seduced by the devil, with whom she lives in sin, in Antwerp, during seven years. In the end she decides to return to her hometown Nimwegen, and repents. After a long and eventful journey she succeeds in receiving absolution from the Pope in Rome. The book instantly became popular. Herman Teule has retraced the story, through the contemporary Latin translation, to its inclusion in Italian in Glorie di Maria by Alfonso de Liguori (1696-1787), which was first published in Naples in 1750 and reprinted many times. The Arabic translation of that version may have been part of the repertoire of texts used by the Roman Catholic Church in the dissemination of the Christian faith in the Middle East. The manuscript seems to originate from Mardin (Anatolia), and came into the possession of the Radboud University of Nimwegen as part of the collection donated in 2003 by the Dutch Syriacist Dr. J.C.J. Sanders. Address of the library of the Institute for Oriental Christianity (IVOC): Erasmusplein 1, NL-6525 HT Nijmegen, The Netherlands. See the press release by Nijmegen University (pdf) and the article by Berthold van Maris in NRC/Handelsblad of November 11, 2008 (pdf). November 2, 2008: Auction of Arabic manuscripts of the private library of Prof. Dr. P.S. van Koningsveld (Institute of Religious Studies, Leiden University). On 18 November 2008 ten Arabic manuscripts of the private library of Prof. P.S. van Koningsveld are auctioned off in Leiden by the auctioneers Messrs Burgersdijk & Niermans (see the auction catalogue, Nos. 675-684). The texts and images of the catalogue are provided here as a download from the site of the auctioneer, and were slightly reformatted, but otherwise are left unchanged. The short introductory text was copied from the printed catalogue (p. 76), of which the title-page is given here as well. Follow-up: On 21 November 2008 the prices for which the manuscripts were actually sold have been added to the auctioneer's estimates. The total collection fetched € 15,800 (hammer price, without the 23,8% buyer's premium)) against an estimate of € 17,000. Several manuscripts have been purchased by Leiden University Library. October 14, 2008: Modern and contemporary Arab and Iranian art and calligraphy. On 23 October 2008 Sotheby's in London auctions a remarkable collection of pieces of modern and contemporary Arab and Iranian art and calligraphy. Two lavishly illustrated catalogues have been published. These catalogues (Session One, Nos. 101-171, 170 pp., and Session Two, Nos. 201-274, 166 pp., price £ 33 each), and other catalogues, which in due course will become important reference works, if only because of the illustrations, can be ordered from Sotheby's, London (tel. +44 (0) 7293 5444), through Sotheby's website, or from Sotheby's offices, 34-35 New Bond Street, London W1A 2AA, United Kingdom. In addition to the well-described and illustrated items, either catalogue contains biographical details of most of the artists in question, and a few have been interviewed especially for this sale by Roxanna Zand. Apart from the interesting figurative paintings and objects there is quite a large number of calligraphies and objects inspired by Arabic calligraphy. Mohammad Ehsai is again among the painters whose work is sold, but there are many more. Mentioning a few is doing injustice to the others who remain unmentioned, but some of the calligraphies immediately catch the eye. This is particularly the case with Twelve fingers by Iranian-born Charles Hossein Zenderoudi (born 1937). The canvas which is painted in acrylic (No. 235 of the catalogue, estimate € 62,000-86,500) is entirely filled with small numbers in different colours. 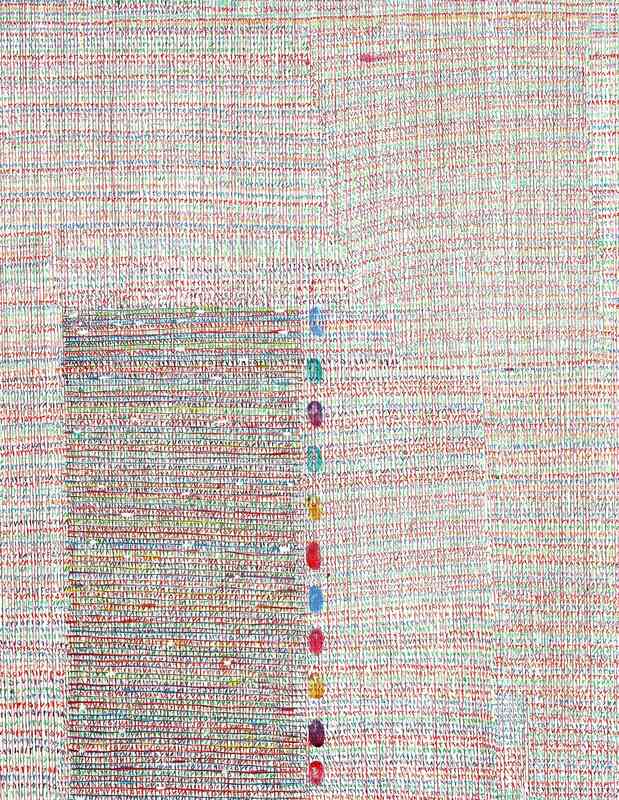 From afar the painting gives the impression of a woven textile. The twelve fingers are, of course, the twelve imams. The provenance of the painting points to a cosmopolitan interest. It was first part of the art collection of the Iranian architect Kamran Diba in Paris, then went to an unmentioned art collection in Egypt and now it has emerged in London. Another interesting piece (No. 128 of the catalogue, estimate € 7,500 - 9,900) is Tajvid No. 12 by Ms. Pouran Jonchi (born 1959, originally trained as a calligrapher in Meshed). This is how the Sotheby catalogue describes this painting: "Tajvid #12 is part of a new body of work by Pouran Jinchi that takes as its departure point the Quran, the sacred text for Muslims. For each of the Recitation drawings, of which Tajvid #12 is one, Jinchi has taken a surah, a chapter from the Quran, and has rewritten it; she has emitted all the consonant letters of the original text but retained the guiding vowels and numbers that are present within it as well as a reference to its name. As the chapter's vowels linger on, floating above the missing letters to indicate how they are to be properly pronounced (tajwid), a harmonious motif of bright green lines and curls results. In the absence of the consonant letters, the copied passage becomes incomprehensible: its vowels are stripped of their linguistic meaning or purpose and they emerge as purely aesthetic decorations. As always, however. Jinchi leaves reminders in each of her drawings of the origin of her markings, in this case allusions to the surahs' names, which provide relief from otherwise utter ambiguity. In addition, the vagueness created by that which is excluded in Jinchi's distorted surahs and the array of possibilities of what the removed may disclose give a nod to the complex and protracted debates that have, at length, surrounded the manifold interpretations of verses, even words, that appear in the Quran; these debates are largely rooted in differences over guiding vowels and pronunciations. Tajvid # 12 and the remainder of the Recitation drawings are part of Pouran Jinchi's project to emphasize the visual and auditory delight to be derived from the Quran as well the open-ended meanings one can read between the lines of this sacred text." Finally, mention may be made here of a painting (No. 126 of the catalogue, estimate € 8,700 - 12,400) by Mohamed Kanoo (born 1963). He is the son of Abdul Latif Jassim Kanoo, the founder of the Beit al-Qur'an in Manama, Bahrain. Mohamed Kanoo's calligraphic work is based on the principle of minimalism (tajrid, and the painting Barcode, now up for auction, showing the first sentence of the Muslim Creed in the form of a barcode, is an eloquent example of the potential of this approach. The artist declares about this painting that he let himself be inspired by Dan Brown's The Da Vinci code. The calligraphic pieces in the two catalogues of the 23 October 2008 sales show how much the old craft of writing beautifully remains a source of artistic inspiration in the modern world. The cosmopolitan backgrounds of the artists, who were all born in the Middle East or North Africa and who all conquered the attention of an international public through their exhibitions and sales worldwide, is another point worth remarking. The presence of their works in Sotheby's auctions means that they have broken through the ceilings of regional limitations and that they find appreciation, also in the literal sense of the word, in all quarters. October 11, 2008: New publication on Egyptian libraries in Late Antiquity. Just published: Harald Froschauer & Cornelia Eva Römer (eds. ), Spätantike Bibliotheken. Leben und Lesen in den frühen Klöstern Ägyptens. Wien (Phoibos Verlag) 2008, 8 + 150 pp, numerous illustrations. Price € 29.50. ISBN 978-3-901232-99-2 (= Nilus, volume 14). Contributions in the volume are in German, French and English. See the table of contents. This is the accompanying volume for a small exhibition in the Papyrusmuseum der Österreichischen Nationalbibliothek, Heldenplatz, Neue Burg, 1010 Wien (the Papyrus Museum in the Austrian National Library in Vienna). It is in so far relevant for the student of Islamic manuscripts that it describes the role of the book in pre-Islamic Egypt. Islam did not invent the book culture which played such an important role in it later on, it found a living book culture in the Eastern Mediterranean when it started to conquer this area. The present catalogue takes the reader to the manuscripts in the Library of the White Monastery in Upper Egypt, not far from Akhmim, but on the Western shore of the Nile. The book is available from the publisher and in the Papyrus Museum in the Austrian National Library. The exhibition runs from 18 April - 14 November 2008. October 11, 2008: Nos. 11-12 of Nama-yi Baharistan. In April 2007 the combined volume of Nos. 11 and 12 of Nama-yi Baharistan has been published in Teheran (ISSN 1608-912X). This is the International Iranian Journal for Research into Islamic Manuscripts. Nos. 11-12 are also counted by the publisher as vols. 6-7, Nos. 1-2 (2005-2006), 437 + 43 pp., many illustrations, price not indicated. Most contributions are in Persian, there are abstracts in English of all articles. This is an important periodical for the study of Islamic manuscripts. See the table of contents of volume 11-12. Nama-yi Baharistan is published by the Iranian Parliament Library (The Library, Museum and Documentation Center of Majles-e Shora-ye Eslami, the Islamic Consultative Assembly). Director of this publication is Mohammad-Ali Ahmadi-Abhari, the editor-in-chief is Nader Mottalebi-Kashani. This and other volumes are available from the publisher, P.O. Box 11155-954, Tehran, Iran, telephone: +9821 66 95 19 19 / 66 95 32 24, fax: +9821 66 46 96 72, by e-mail to the publisher, or by e-mail to the editor. See also the publisher's website. October 11, 2008: New publication: the Hans Daiber Festschrift. Just published by Brill's in Leiden: Anna Akasoy & Wim Raven (eds. ), Islamic Thought in the Middle Ages. Studies in Text, Transmission and Translation, in Honour of Hans Daiber. Leiden - Boston (Brill's) 2008 (711 pp.) ISBN 978 90 04 16565 6. Price: € 185 (= approximately US$ 276). The book is at the same time volume 75 of the series Islamic Philosophy, Theology and Science. Texts and Studies (ISSN: 0169-8729). This important collective volume on contains anumber of articles Islamic Philosophy and Theology, the Hstory of Science, the Cross-cultural transmissions of Arabic Philosophy and Science, and on Language and Literature. Manuscripts are the subject of a number of the contributions in the volume. See the table of contents. The history of Islamic thought in the Middle Ages, the impact of Greek philosophy and science, and the formation of an own theological tradition, is a long and complex one. The articles in this volume dedicated to Hans Daiber, one of the pioneering scholars in this field, offer new insights from a variety of perspectives: philological, philosophical, and historical. The subjects range from Islamic philosophy and theology, over the history of science, the transmission into other medieval cultures to language and literature. In addition to their specific discoveries, they give an impression of the dynamics of medieval Islamic intellectual history as well as of the diversity of approaches needed to understand this dynamics. About the two editors: Anna Akasoy, PhD. (2005) in Oriental Studies, University of Frankfurt, is Lecturer at the Oriental Institute, University of Oxford. She has published on the history of Islamic philosophy and science, including The Arabic Version of the Nicomachean Ethics (Brill, 2005). Wim Raven, PhD. (1989) in Arabic Studies, University of Leiden, taught at the Free University of Amsterdam and Frankfurt University, is now Lecturer at the Centre of Near and Middle East Studies, University of Marburg. He has worked on Hadith and early Islam. Available from the publisher. October 8, 2008: Important auction of objects of Islamic interest, including Qur'anic manuscripts. Today one of the half-yearly auctions at Sotheby's London is being held. The lavishly illustrated catalogue Arts of the Islamic World shows a number of manuscripts, textiles, tile works, ceramics, wood work, weapons, sculptures and carpets from a variety of origins and periods. Together the catalogue can be read as a virtual museum of Islamic art, the exhibits of which have in one single day changed hands and will for the time being disappear from sight. There is a trend, since a year or two, to auction off textiles from holy places, notably curtains and the like originating from the burial chamber of the Mosque of the Prophet Muhammad in Medina. Sotheby's catalogues are a rare occasion to view these very special objects, which even Muslims visiting the Prophet's grave cannot always view at ease (Catalogue Nos. 28-36. The Sotheby Islamic catalogues usually begin with a section on manuscripts and manuscript leaves. In the present catalogue, as in the previous one, the first items are Qur'anic fragments on parchment of a variety of origins, sizes and periods (present catalogue Nos. 1-27). The present catalogues is in so far exceptional that it offers for sale as its third item a single leaf (measuring 35.5 x 27.5 cm) of what is said to be Higazi and to date from the second half of the 7th century AD. Even if one dismisses such an early dating as pious or wishful thinking, the leaf makes an old impression. See the recto side, the verso side, and a detail of the verso side. The leaf which had an estimate between GBP 400,000 and GBP 500,000 was sold for (hammer price + buyer's premium) GBP 481,250. See the description of this fragment in the catalogue, which appears to be identical to a section of 32 leaves in the Chester Beatty Library in Dublin (James 1980, no.1. p.14). This catalogue (416 pp., price £ 33), and other catalogues, which in due course will become important reference works, if only because of the illustrations, can be ordered from Sotheby's, London (tel. +44 (0) 7293 5444), through Sotheby's website, or from Sotheby's offices, 34-35 New Bond Street, London W1A 2AA, United Kingdom. October 8, 2008: New manuscript catalogue, Aleppo, Syria. New catalogue published: The library of the George and Mathilde Salem Foundation (Aleppo) is one of the most important private collections of manuscripts in the Syrian Arab Republic. It contains 547 copies in Arabic, Syriac and other languages about Christian and Islamic theology, history, grammar, science, liturgy, poetry and literature. The new catalogue offers a detailed record and description of these manuscripts. It includes full indices of titles, personal names, subjects and places. Availabe from: Reichert Verlag Wiesbaden, Tauernstrasse 11, D-65199 Wiesbaden, Germany. Contact the publisher. September 30, 2008: Publication of Lecture by Alastair Hamilton: The Forbidden Fruit. The Koran in Early Modern Europe. Prof. Alastair Hamilton has added another title to the number of his publication on the relations between Europe and the Arab World. In The Forbidden Fruit he gives a lucid survey of how Christian Europe developed its attitudes towards the Holy Book of Islam and he describes the political and religious backgrounds of the publication of the early European Qur'an translations (16th-18th centuries). This beautifully illustrated lecture was published in May 2008 by LMEI the London Middle East Institute, a division of SOAS (Thornbaugh Street, Russell Square, LONDON WC1H 0XG, UK). September 15, 2008: Computer-aided typography of the Qur'an. On September 8, 2008, the Minister of Awqaf and Religious Affairs of the Sultanate of Oman gave the go-ahead to DecoType, a Dutch firm established in Amsterdam, for designing a Koran in Unicode using Tasmeem software at the occasion of the Holy month of Ramadan 1429. Mr. Thomas Milo, president of Decotype: "I gave a brief lecture about the project in the Grand Mosque. I did so in Arabic alternating with English for an audience consisting of two ministers (one of whom is the heir apparent to H.M. Sultan Qaboos), dignitaries, including the Anglican bishop and the head of a protestant Christian mission institute in Muscat, and members of the corps diplomatique. The project is starting this month and involves tackling a series of unresolved problems regarding the Unicode coverage of Koran orthography, as well as the related typographic issues." Earlier, Decotype's Tasmeem software had been used for the private publication in 2007 of Dr. Laban Kaptein of the first critical text edition of the Dürr-i Meknûn, the Turkish cosmography by the famous dervish Ahmed Bican Yazicioglu (ISBN: 978-90-9021408-5). See some sample pages of that edition here. September 8, 2008: Arabic typography and Typographic matchmaking. September 2007 saw the publication of the attractively designed book by Huda Smitshuijzen AbiFarès, entitled Typographic matchmaking. Building cultural bridges with type face design. Amsterdam 2007. Published by BIS Publishers, P.O. Box 323, Amsterdam 1000 AH, The Netherlands (website), jointly with the Khatt Foundation (website), equally in Amsterdam. - Seria, designed by Martin Majoor. - Sada, designed by Martin Majoor & Pascal Zoghbi. - Fresco, designed by Fred Smeijers. - Fresco Arabic, designed by Fred Smeijers & Lara Assouad-Khoury. - Fedra Serif A & Fedra Sans, designed by Peter Bilak. - Fedra Arabic, designed by Peter Bilak & Tarek Atrissi. - TheMix, designed by Lucas de Groot. - TheMix Arabic, designed by Lucas de Groot & Mouneer Al-Shaarani. - BigVesta, designed by Gerard Unger. Together with the book comes a CD with fonts, but this proves to be somewhat of a disappointment, since the added fonts (TrueType) are only beta versions of some of the designs introduced in the book and cannot, apparently, be used in a word processor, but only, as it would seem, in the Middle East version of Adobe's InDesign. Nevertheless, the books remains an attractive account of a successful attempt to improve Arabic typography. Earlier work by Huda Smitshuijzen AbiFarès includes Experimental Arabic Type, Dubai (Saatchi & Saatchi) 2003, and Arabic typography. A comprehensive sourcebook, London (Saqi Books) 2001. August 23, 2008: New publications from Kuwait. - Just published: volume 26 (2008) of Hadeeth ad-Dar, the quarterly publication of the Dar al-Athar al-Islamiyya (address: National Council for Culture, Arts and letters, P.O. Box 23996, Safat, 13100, Kuwait). The present number contains a selection of the lectures held during the Cultural Seasons 2003-2008, organized by Dar al-Athar al-Islamiyya in Kuwait. Texts in Hadeeth ad-Dar are published both in English and in Arabic. See the title-page and table of contents. "The journal Hadeeth ad-Dar of Dar al-Athar al-Islamiyyah (DAI) is intended to share the wealth and beauty of Islamic culture contained within the extensive and comprehensive al-Sabah Collection of Islamic art and the variety of scholarly and artistic activities associated with the collection. The collection itself, ranging from early Islam to the 18th century, is organised according to both historical period and geographical region. The reference library and the publications of DAI are closely related to the collection. DAI has sponsored archaeological excavations in Bahnasa, Upper Egypt that date to the Fatimid period. We are also involved in the Raya excavation at al-Tur, in Sinai Peninsula in Egypt. At present, our annual lecture series has been revived and is a focal point for historians and other specialists in the field. It features talks by prominent international scholars on various topics of Islamic art, history archaeology and architecture." - Simultaneously published: issue 2 of year 10 (2008) of Bareed ad-Dar, the bi-monthly newsletter of The Friends of Dar al-Athar al-Islamiyya (same address). It contains among other things reports on the celebration of the 25th anniversary of Dar al-Athar al-Islamiyya, on a trip to the island of Failaka, and on the lectures held in February-April 2008 during the 19th Cultural Season organized by Dar al-Athar al-Islamiyya. At the end is a list of objects still missing after Dar al-Athar al-Islamiyya was looted during the Iraqi invasion. The Bareed ad-Dar is published in English. See the cover. Complimentary subscriptions to either publication are available upon written request. August 1, 2008: Studies on the Kitab al-Musta`ini by Ibn Baklarish published. Just published: Charles Burnett (ed. ), Ibn Baklarish's Book of Simples. Medical remedies between three faiths in twelfth-century Spain. London (The Arcadian Library in association with Oxford University Press) 2008. Price: US$ 170. The magnificently published and lavishly illustrated book is available from the publisher. In October 2003 the Arcadian Library in London purchased a previously unknown manuscript of the Kitab al-Musta`ini by Ibn Baklarish, an important book of materia medica written in the Iberian peninsula at the turn of the eleventh and twelfth century. The copying of Arcadian Library manuscript was completed on 18 January 1130 AD. On 10 September 2005 a number of scholars (Charles Burnett (London), Ana Labarta (Valencia), Joëlle Ricordel (Paris), Juan Carlos Villaverde Amieva (Oviedo), Jan Just Witkam (Leiden), Geoffrey Khan (Cambridge), David Wasserstein (Nashville), Emilie Savage-Smith (Oxford), Anna Contadini (London)) came together in the Arcadian Library and shared their expertise on the content of the Arcadian manuscript and assessed its significance in relation to other manuscripts of the same text and within the context of 11th- and 12th-century medicine in Islamic Spain. The present publication contains the papers presented at that symposium. See the title-page and table of contents. June 30, 2008: Exhibition of Islamic manuscripts in Leipzig, Germany (11 July - 27 September 2008). 'Ein Garten im Ärmel ('A Garden up your sleeve', so called after a metaphor invented by al-Gahiz) is the title of an exhibition on Islamic book culture which is held in the Library of the University of Leipzig, Germany (Address: Beethovenstrasse 6, Leipzig), from 11 July through 27 September 2008. The manuscripts which are exhibited all come from the collections of Leipzig University Library, which is the proud owner over some 1800 Islamic manuscripts. The exhibition is part of the project on Islamic manuscripts, financed by the Deutsche Forschungsgemeinschaft. It embodies the co-operation between Chair of Arabic Studies and Oriental Philology (Prof. Dr. Verena Klemm [contact]) at the Oriental Institute of Leipzig University and the Director of the Library of that same University (Prof. Dr. Ulrich Johannes Schneider [contact]). The results of this project can be read in the project's website. A lavishly illustrated catalogue of the exhibition is published and can be obtained from Leipzig University Library (further details on price and availability to be obtained during the exhibition from the Leipzig Library). In the course of July 2008 the exhibition will be accompanied by a lecture series (details in the Library's website). See also the exhibition's official announcement. See the cover, title-page, table of contents and list of authors of the catalogue. June 27, 2008: Conference in Oxford, Wadham College, 14-15 July 2008: The Rise of the Persian Renaissance. This conference is part of a joint programme between three European universities of Leiden, Cambridge and Oxford on the history of Persian literature and culture. The programme was discussed and developed at the inaugural meeting of the European League of Non-Western Studies (ELNWS), which was established in Leiden in July 2006. The first conference of this programme 'Traditions in Persian Linguistics and Literature', scheduled for five years (2007-2011) was successfully organized jointly by the Leiden and Oxford Universities in Leiden in July 2007. The main aim of the two day conference is to investigate the phenomenon of the 'sudden' revival of Persian culture in the 9-10th centuries after a chronological gap of two centuries. This period in the scholarly literature dedicated to the Iranian studies is usually called 'two centuries of silence' due to the lack of almost any evidences of written monuments between the Arab invasion in Sasanian Iran in 7th century A.D. and the earliest surviving literary examples in the New Persian language of the period of the Samanid dynasty (819-999) with their capital in Bukhara. Convenors: Firuza Abdullaeva (University of Oxford) and Asghar Seyed-Gohrab (University of Leiden). June 26, 2008: British report on digitized resources in Islamic studies, with special reference to Islamic manuscripts. In February 2008, Exeter University Library was awarded GBP 34,900 by the Joint Information Systems Committee (JISC) of behalf of HEFCE (Higher Education Funding Council for England), to carry out a survey into User Requirements for Digitised Resources in Islamic Studies. JISC will study this report and will pass on any recommendations to HEFCE, who will be announcing their wider strategy for Islamic Studies in Higher Education later this summer. See the full text of the JISC report. It is a substantial document, but the Executive Summary and Recommendations can be found on pages 5-11. For details of all the other reports which have been commissioned by HEFCE since June 2007, when Islamic Studies was designated a Strategic Subject by the UK Government, go to the HEFCE website (subsection Islamic Studies). Communication by Paul Auchterlonie, Librarian for Middle East Studies, University of Exeter, Old Library, Prince of Wales Rd., Exeter EX4 4SB, U.K.
June 24, 2008: New publication on diplomatic documents in the Mamluk era. Frédéric Bauden (University of Liège, Belgium) has just published his article 'Les relations diplomatiques entre les sultans mamlouks circassiens et les autres pouvoirs du Dar al-islam. L'apport du ms. ar. 4440 (BNF, Paris)', in Annales islamiques 41 (2007), pp. 3-29. See the article. June 22, 2008: Islamic manuscripts and books in the Islamic Studies Library, McGill University, Montreal. Mark Abley has just written an interesting article, 'Understanding Islam', in McGill News, Spring/Summer 2008, pp. 23-27, on Islamic books and manuscripts in Montreal, with interviews with Robert Wisnovsky, F. Jamil Rageb, Khalid Mustafa Medani and Adam Gacek. See the article. June 12, 2008: New publications on Islamic manuscripts from Tehran. We have just received from The Research Centre for the Written Heritage (Miras Maktoob), address: No. 1304, 2nd Floor, Farvardin Building, Between Daneshgah and Abureyhan St., Enqelab Ave. Tehran, I.R. Iran 1315693519 (P.O Box 13185-519) Nos. 10-11 of its Monthly Journal of Textual Criticism, Codicology and Iranology Heritage Report (Gozaresh-e Miras) of July-August 2007. See the table of contents. We have also just received from the same Institution a copy of its Quarterly Journal of Book Review, Bibliography and Text Information, Mirror of Heritage (Ayene-ye Miras), New Series, vol. 5, issue 4 (= No. 39) of Winter 2007 (ISSN 1561-9400). See the table of contents. May 23, 2008: 325th Anniversary of Brill Publishers in Leiden. At the celebration of the 325th anniversary of Brill's, the well-known publishing house in Leiden, a history of the firm, from the early beginnings in 1683 till the present day, has just been published: Sytze van der Veen (met bijdragen van Paul Dijstelberge, Mirte D. Groskamp & Kasper van Ommen), Brill. 325 jaar uitgeven voor de wetenschap. Leiden/Boston 2008, 180 pp. See the cover and title-page. The text of the book is in Dutch, but since it is profusely illustrated this should not pose a problem for the interested reader. Brill's has been known, and is still well-known, for its prestigious publications in the field of Oriental studies. See the publisher's own jubilee website. May 22, 2008: New publications on Islamic manuscripts from Tehran. We have just received from The Research Centre for the Written Heritage (Miras Maktoob), address: No. 1304, 2nd Floor, Farvardin Building, Between Daneshgah and Abureyhan St., Enqelab Ave. Tehran, I.R. Iran 1315693519 (P.O Box 13185-519) No. 12 of its Monthly Journal of Textual Criticism, Codicology and Iranology Heritage Report (Gozaresh-e Miras) of September 2007. See the table of contents. We have also just received from the same Institution a copy of its Quarterly Journal of Book Review, Bibliography and Text Information, Mirror of Heritage (Ayene-ye Miras), New Series, vol. 5, issue 3 (= No. 38) of Autumn 2007 (ISSN 1561-9400). See the table of contents. May 13, 2008: New publications on Islamic manuscripts from Tehran. We have just received from The Research Centre for the Written Heritage (Miras Maktoob), address: No. 1304, 2nd Floor, Farvardin Building, Between Daneshgah and Abureyhan St., Enqelab Ave. Tehran, I.R. Iran 1315693519 (P.O Box 13185-519) Nos 8-9 of its Monthly Journal of Textual Criticism, Codicology and Iranology Heritage Report (Gozaresh-e Miras) of May-June 2007. See the table of contents. We have also just received from the same Institution a copy of its Quarterly Journal of Book Review, Bibliography and Text Information, Mirror of Heritage (Ayene-ye Miras), New Series, vol. 5, issue 1, 2 (= Nos. 36-37) of Spring, Summer 2007 (ISSN 1561-9400). See the table of contents. 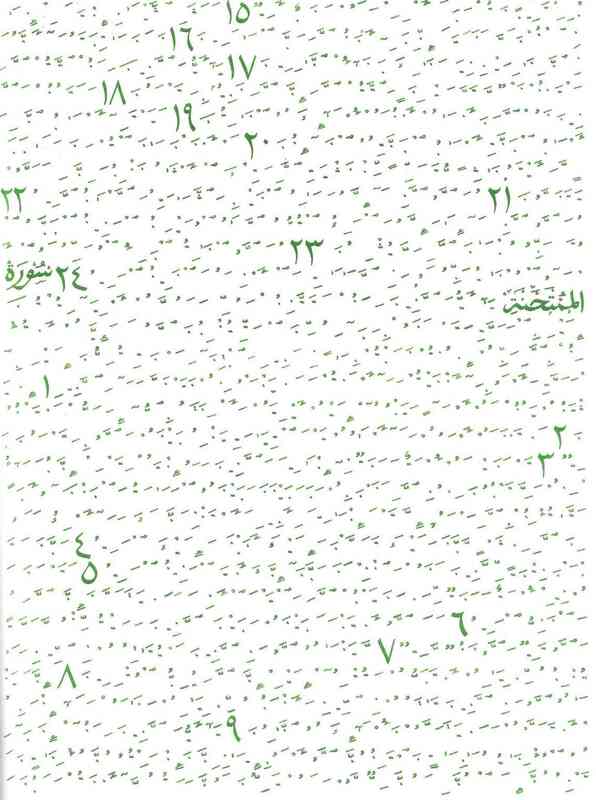 May 11, 2008: New publication on the dots in Arabic script. Prof. Andreas Kaplony (University of Zürich, Switzerland) has just published an enlightening article on the writing of dots in Arabic script based on research on a corpus of texts from the first and second centuries of the Islamic era: Andreas Kaplony, 'What Are Those Few Dots For? Thoughts on the Orthography of the Qurra Papyri (709-710), the Khurasan Parchments (755-777) and the Inscription of the Jerusalem Dome of the Rock (692)', in: Arabica 55 (2008), pp. 91-112. Read this article: (pdf). Contact the publisher, Brill's in Leiden, about this journal. 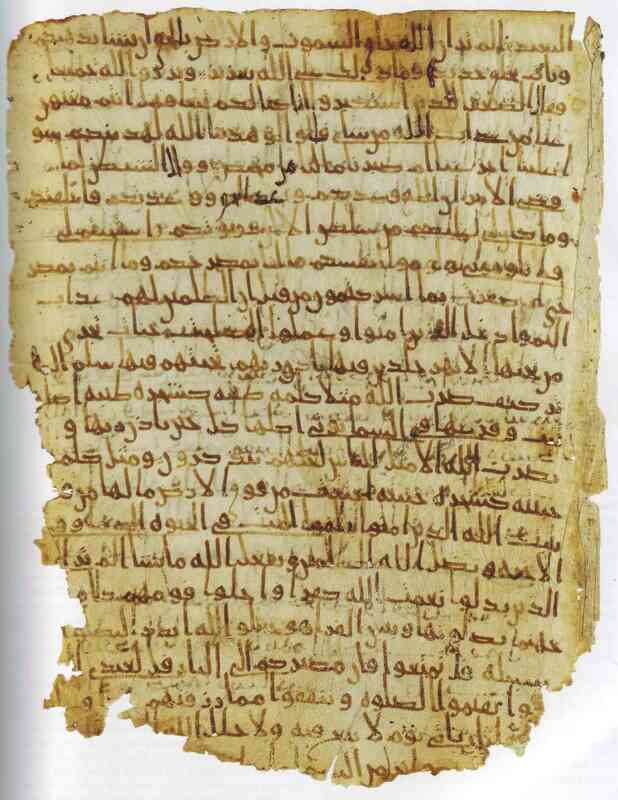 April 18, 2008: Arabic documents from early Islamic Khurasan. The history of Eastern Iran (Khurasan) in the Abbasid period has so far been based on literary sources, which, regrettably, tell us practically nothing of its administration, and the documentary material in Arabic has related almost entirely to papyri from Egypt. The lacuna has now, however, been dramatically filled by the discovery of the documents published in this volume, apparently from a private archive of landowners in north-eastern Afghanistan in the later 8th century AD. They appear to complement the more or less contemporary corpus of Bactrian documents in the Khalili Collection published by Nicholas Sims-Williams, which mention many of the persons and place-names in the Arabic documents. Together the two collections are of prime importance for the history of daily life in early Islamic Khurasan. After an exhaustive introduction on the subject Prof. Khan provides a detailed analysis of 32 Khurasani documents kept in the Khalili Collection in London, which includes high quality reproductions of each document, a transcription, an English translation and a commentary on language and content. Available from the publisher. January 24, 2008: Sotheby's Institute of Art offers graduate courses in the history of art, connoisseurship and the world of art markets. Sotheby's Institute (London, New York, Singapore) has just published its program for 2008-2009. Among the wide range of courses offered by Sotheby's Institute (see the Institute's site) there are unfortunately no specific courses for Islamic art, but the courses on the international art trade may be interesting for all those interested in developing a career in the field of Islamic art. January 22, 2008: Selected proceedings of Qur'an conference published. Oxford University Press, in association with the Institute of Ismaili Studies in London, on 18 February 2008 publishes the selected proceedings of the conference "Word of God, Art of Man. The Qur'an and its Creative Expressions". The volume is edited by Fahmida Suleman. The conference was held in London, 18-21 October 2003. See the announcement of the publisher (pdf). See the original programme of the conference of 2003 (pdf). January 17, 2008: Archive of microfilms of ancient Qur'an manuscripts not lost as previously assumed. What had been known for several years among specialists has now seeped out into the international press: The microfilms of ancient Qur'an manuscripts which were collected by pre-war German scholars with the purpose to prepare a critical edition of the Qur'an were not lost in the war, contrary to what always had been thought. The international press has taken up the issue with strong conspirational overtones. - Read the article "Indiana Jones meets the Da Vinci Code" by Spengler in Asia Times online of January 15, 2008 (pdf). - Read the article "The Lost Archive" by Andrew Higgins in the Wall Street Journal of January 12, 2008 (on-line version) or January 17, 2008 (paper version): press cutting (pdf) or text taken from the website (pdf) of the Wall Street Journal. September 18, 2007: The Max Weisweiler Archive in Leiden University Library described. 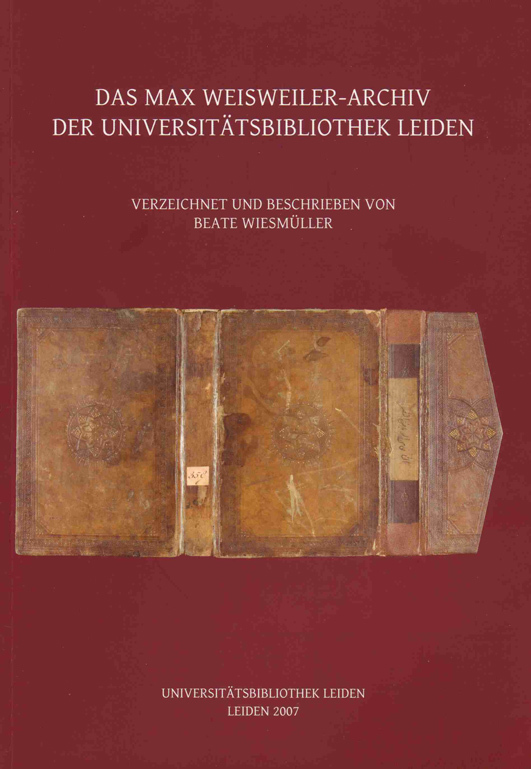 - In the course of July 2007 Ms. Beate Wiesmüller saw her catalogue of the Max Weisweiler Archive being published as volume 37 in Codices Manuscripti, a series of manuscripts catalogues published on behalf of Leiden University Library: Das Max Weisweiler Archiv der Universitätsbibliothek Leiden. Leiden 2007, text entirely in German, illustrated, 153 pp. (ISSN 0169-8672 volume 37). Price: € 15. - Leiden University Library had in 1989 purchased the scholarly notes of the German Orientalist Max Weisweiler (1902-1968). These notes, which are basically the contents of Weisweiler’s desk in his private study, had been kept for many years by his widow. Only when she died, Weisweiler’s private library and study notes came up for sale and were purchased by Brill’s antiquarian bookshop in Leiden. The scholarly notes were eventually acquired by the Leiden Library, where they were registered as Or. 22.307. The greater part of the archive reflects Weisweiler’s interest in Islamic bindings. A large collection of rubbings from bindings in Germany, Holland and Turkey is part of the archive. - The author of the catalogue, Ms. Beate Wiesmüller, is young a German islamologist, who is presently attached to the University of Leipzig where she works on catalogues of Arabic manuscripts in collections in Germany. - Source: Extracted from Nieuwsbrief Universiteit Leiden, dated 18 September 2007, with additional information from the book itself. September 18, 2007: Exhibition Spice of Life. Raffles and the Malay world. Sir Thomas Stamford Raffles (1781-1826) is best known today as the founder of Singapore, but he was in fact a passionate scholar of all aspects of the Malay world during nearly twenty years in Southeast Asia in the service of the British East India Company. Raffles was first posted to Penang and Melaka, and later served as governor of Java (1811-1816) and of Bengkulu in Sumatra (1818-1824). His monumental work The History of Java, published in 1817, made his name and earned him a knighthood. September 16, 2007: Just appeared: Constant Hamès (ed), Coran et talismans. Textes et pratiques magiques en milieu musulman. Paris 2007. 416 pp., illustrated. (Éditions Karthala). Price € 29. ISBN 978-284586-873-1. This collective work is the result of research undertaken between 2000 and 2003 in the French National Centre for Scholarly Research in Paris (CNRS) under the title ’Magic and islamic writing in the African and European Worlds’ (Magie et écriture islamique dans les mondes africain et européen). Textual magic in Islam has had few students. Edmond Doutté’s Magie et religion dans l’Afrique du Nord dates from as early as 1908. Tawfic Fahd’s ground breaking thesis, La divination arabe, dates from 1965. A recent collective work was edited by Emilie Savage-Smith (Magic and divination in early Islam, Aldershot 2004). So the present work is a welcome addition to the field. The authors concentrate on contemporary magical practice of classical Islamic texts, from the Qur’an itself till al-Buni. And within that field they have focussed on the use of Arabic writing in magical practice, be it on paper, textile or metal. They combine an anthropological and islamological approach, and refer to practices in Tunisia, Yemen, Mauritania, Senegal, Mali, the Comores, Madagascar and France. One of the major works used is al-Buni’s Shams al-Ma`arif. The editor of the present volume has a longstanding familiarity with the subject as is clear from his thesis L’art talismanique dans l’islam d’Afrique occidentale (‘Talismanic art in the Islam of West Africa’), which he defended in 1997. See for the full table of contents of the volume here. September 15, 2007: Shahnama Studies I. This well-produced and lavishly illustrated volume (300 pp. ), edited by Charles Melville, and published in 2006 by The Centre of Middle Eastern and Islamic Studies, University of Cambridge, is the result of the first Shahnama Workshop held in Pembroke College, Cambridge, in January 2001. Charles Melville is the co-ordinator of the Shahnama Project which has the ambition to bring together all miniatures in all manuscripts of Firdawsi’s Shahnama in one single database. The imposing results so far can be viewed in the new website of the Shahnama project . A paperback copy of the book is available for £ 25 plus postage from the Centre of Middle Eastern and Islamic Studies, University of Cambridge, contact. September 13, 2007: PhD thesis on Islamic scribal practices and manuscript manufacture in Central Asia defended in Paris. On Thursday 13 September 2007 Ms. Marie Efthymiou defended her thesis entitled Transmission manuscrite du Coran. Pratiques scribales et techniques de fabrication du livre manuscript en Asie centrale (`The written transmission of the Qur'an. The history of scribal practices and manuscript production in Central Asia’, 313 pp, illustrated). Supervisor of the thesis was Professor François Déroche of the École Pratiques des Hautes Études, Sorbonne, Paris. Ms. Efthymiou passed her examination with honours. The thesis, which was written in French, will hopefully be published at some stage in the not too far future. September 10, 2007: The Smitskamp/Brill Archives now in Leiden University Library. The Turkish artist Dr. Mehmet Refii Kileci in Rotterdam, The Netherlands, starts from 2 February 2007 onwards his course in marbling (level 1). From 20 January 2007 onwards he starts his courses in marbling (level 2), and calligraphy. Place: Rumi Kunst Instituut, Piekstraat 23 f, 3071 EL Rotterdam, tel: 020 471 0026. Catalogue of manuscripts in al-Khalidiyya Library, Jerusalem. Prepared by Nazmi Al-Ju`beh. Edited by Khader Salameh. (With a preface by Sheikh Ahmad Zaki Yamani, and an introduction on the history of the Khalidiyya Library by Walid al-Khalidi). Al-Furqan Islamic Heritage Foundation. London 2006/1427. Available from the publisher: Al-Furqan Foundation, Eagle House, High Street, Wimbledon, LONDON SW19 5EF, U.K.
A thematically arranged catalogue in Arabic describing 1985 manuscript volumes, with indexes for book titles and authors’ names. M.H. Custers, Al-Ibadiyya. A bibliography. Maastricht 2006. 3 vols. Vol. 1. Ibadi`s of the Mashriq, 432 pp. ; vol. 2. Ibadi`s of the Maghrib (incl. Egypt), 371 pp. ; vol. 3. Secondary literature, 348 pp. Recently published by the same author: Ibadi publishing activities in the East and in the West, c. 1880-1960s. An attempt to an inventory, with references to related recent publications. Maastricht 2006, 114 pp. These works are privately published by the author and can be ordered directly from him: Mr. Martin H. Custers, Emilionlaan 3, NL-6213 GL MAASTRICHT, The Netherlands. Mail for further information. January 4, 2007: New publication: The detailed defter of the Liwa` (district) of Noble Jerusalem. Tapu Defter No. 427 (932 AH/1525-26 - 934 AH/1527-28 Basbakanlik Osmanli Arsivi. A critical and annotative study of the Ottoman text with Arabic translation [by] Muhammad Adnan al-Bakhit and Noufan Raja al-Sawariyyah. See for a full review here . January 3, 2007: In August 2006 a new Malay manuscript was acquired by Leiden University Library. On 7 December 2006 the Leiden library issued a press release on the acquisition of this new acquisition. See for images and bibliographical and codicological details of this manuscript here.